The best pool slides take your pool enjoyment to another level that keeps both children and adults excited. These products need not be crazy or wild to offer the much-needed fun and excitement; a simple slide will be just fine and safe. Children and adults alike will cue behind the slide for their moment to whizzing down the pool slide deck into your swimming pool. Choosing the right slide is, however, not easy. And this is where we come in handy as we will look at how to approach the process of buying the perfect slide for your pool and look at a review of the top slides on the market today. A swimming pool with a slide enables friends and family to make life-long memories right in their backyard while sliding towards the pool. But before that, you need to get the best type of slide for your swimming pool. This type of slide is straight at the top and curved at the bottom. It also features a closed or open stairway that makes your slide to be spacious, making it a great product for the entire family use. 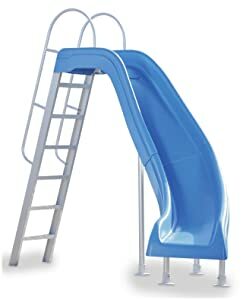 The slide comes with stairs that function as a ladder and it enables you to vary the height from 12 to 8 feet. These slides fit well with smaller swimming pools because of their simple shape. These types of slide often have a curvier and steeper design. They usually curve to the left or right near the pool, which makes the splash more exciting. Just like the straight leg slides, you can choose the ideal size of the stairway – this depends on the layout of the product. 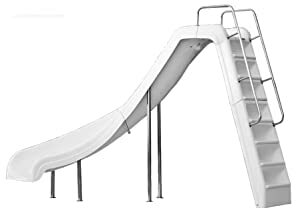 Generally, this type of slide is about 8 feet tall and comes with a closed stairway that prevents kids from climbing unsupervised. This is a truly unique type of slide due to its one of a kind design. The two major kinds of elephant leg slide are the stream design and the G-force pattern; each designed to provide maximum fun at your pool. The G-force has a curvy design that is similar to a DNA strand or cavatppi paste noodle and is about 9 feet tall. 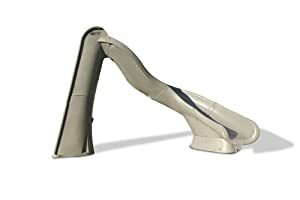 The stream model looks like a molded slide leg but has a steeper drop at the top of the slide as opposed to the end. This unit is quite tall, standing at around 14 feet tall, and it is also large. There are hundreds of swimming pool slides available on the market today. However, this shouldn’t frit you out since there is a simple way to make your search to be easy by narrowing down your search to just a few details. The footprint will be determined by the amount of space around your swimming pool. Some slides take up lots of room to install the curves. Therefore, ensure that you measure the space you have and then go through the specifications of the product you want to buy. Some manufacturers offer a schematic that outlines the overall width and length of surface needed for installation. In addition, you should think about the space required by the sliders behind the slide to enable them to climb comfortably. The material used to make your slide is critical since you should aim to get the most durable and hardwearing slide you can get and afford. The majority of these slides are made to last for years. Rotationally molded polyethylene plastic or fiberglass gelcoat is the most used material because they provide a friction-free and strong surface. In addition, they are rust and chemical resistant and take decades to fade in UV rays. Location is quite critical since most slide producers recommend installation near a swimming pool depth of about 44-48 inches of water. Stepper or more severe units will require more depth. This definitely rules out installing your slide by the narrow or shallow end of your swimming pool. You don’t want the sliders to hit the surface of your pool after enjoying a thrilling slide. With that said, you shouldn’t install the slide on the deep end of your pool. For safety purpose, a product that can be installed in an area where an adult can stand is recommended. The Consumer Product Safety Commission (CSPC) has provided standard safety measures for the providers of pool slides. Good, meandering curves that will probably throw you side-to-side will add the desired excitement. Today, you can get a 360 degrees twist slide that is well constructed. Twists, curves, and dips – think about the adrenalin rush that you want to achieve and whether you have the money and space to accommodate this. Again, consider the kids when deciding whether to get a 360 degrees unit. There is no need of having a pale blue colored pool slide. Now, there are a variety of colors that you can choose from, your choice will depend on your yard and décor. White is a superb contrasting color to your pool, and it doesn’t get excessively hot during the sunny days. Earthy colors such as grey and brown are also common since they complement your yard landscape. You should go for a slide that you can easily install without seeking the help of a professional. If you buy a larger product that requires professional assistance when installing, we would recommend you to check with the manufacturer to know if they provide this service. That in mind, even the simplest pool slide will require some form of drilling when being installed. An important thing that you should consider is the size of the slide you want to buy. If you have a child and you also want to have some fun from the slide, you will most likely want a unit that is large enough to accommodate more weight and enable you to gain speed before you hit the splash. On the other hand, if the slide is for little kids, a moderate slide will be fine (actually, you can even go for an inflatable model if it is exclusively for small kids). For this article, we have considered slides that can accommodate adults. A good place to start is to get a product that can hold a weight capacity of about 200 lbs. Water hookup means that running water will run/slide along the flume when you are sliding down. Having a wet surface increases the excitement, and it is worth every penny to get such a surface. An alternative way is to get a pool slide that connects to a garden hose. It will serve the same purpose. Above all, the other features you should consider the safety of the unit you want to buy. Luckily, today’s slides come with lots of safety features and are regulated by CPSC – ensure that your unit follows their guideline. With a CPSC approved pool slide, you can rest assured that sliders are safe since it has undergone the necessary safety tests before being availed on the market. Other safety measures that you should consider include large secure handrails and wide ladder treads. The cost is an important factor that many people consider when buying a pool slide. There is no limit to the amount of money that you should spend. With that said, you can get a slide that will accommodate adults from as low as $2000. For a larger, more complicated unit (360 degrees), you should expect to pay more. Here is a review of the top pool slides on the market today. S.R. Smith 698-209-58124 is one of the best slides on the market today and kids really love making a big splash when enjoying your swimming pool. The product features the majority of the same amazing features of S.R. Smith Turbo Twister, but it is a bit shorter, standing at around 4 ft. 1 inch high. The slide is incorporated with great safety features such as an enclosed ladder, molded in handrails, and has little-exposed metals. The best thing, you can use this slide for saltwater and chlorine pools without worrying about the product getting corroded. Its water delivery system is connected via a garden hose and the product comes as a right curve slide only in gray granite color (you can also find it in sandstone or taupe colors, to match your backyard décor). The slide accommodates adults and children of up to 175 lbs. and it fully follows the CPSC safety standards for pool slides. Perfect for all inground swimming pools, the slide comes with a 3 years warranty that covers manufacturer’s defects. Another great thing you will love about this slide is that it’s meant for a small deck and perfect for budget-conscious buyers. It flume is about 7 feet long and can also be used for standard swimming pools. The slide comes with an installation manual that makes its installation an easy process. Assembling is quite simple, with the product easily mounting on the deck and needs no anchors. Its rotomold design ensures that it will be a durable and sturdy fixture in your pool for many years to come. Needs no water supply or plumbing – uses a hose. Accommodates sliders of up to 175 lbs. Designed for easy and quick assembly. The Inter-Fab CITY2-CRB is an economical slide for inground pool owners who want a product that their kids can slide on, but do not want to spend a lot of cash. The slide features sturdy and firm all extruded aluminum steps, supports, and rails and is very easy to assemble. Its 2-part flume is constructed of a durable acrylic material, with no fiberglass reinforcement, and supports sliders of up to 225 lbs. The water supply of this slide is the one found on other more expensive Inter-Fab’s products, guaranteeing you the same breathtaking slide at a pocket-friendly price. Its zoom flume water supply system can be connected to a garden hose or to your pool’s pump return. Either way, sufficient water shoots down the slide to provide a slippery slide adventure and an addictive splashdown. Easy to install, the slide comes with an installation guide or you can even visit inter-fab.com to get all the information you require when installing it by viewing an installation video. The best part, the slide can be found in four different colors of blue, gray, tan, and white, meaning you can try to match your décor. The product is designed to assure safety and performs at the best possible standards. The other thing you will love about this slide is that it comes in both rights and left curve and is made in the United State. It also comes with a 1-year warranty and made to resist any impact. Found in both right and left curve. Has a sturdy aluminum ladder. S.R. Smith 688-209-58123 provides you water park excitement right in your swimming pool, making your kids fall in love with your pool. The slide stands at about 8 feet tall to offer a high-volume water runway system that provides breathtaking rides that every kid and adult will love. It comes in gray granite and sandstone designer colors that match your backyard décor and, the best part, you can choose between right or left curve to accommodate different deck spaces. Its water delivery system can either be through a garden hose or your plumb return line and this provides high volume water that will be sufficient to offer a fantastic splash. Safety is critical when it comes to slides, and this unit has guaranteed safety by having an enclosed ladder, deep flume, and molded in handrails for maximum safety. The other thing that makes this slide a must-have product is the sturdy rotomolded design that adds to its durability, longevity, and strength. With little-exposed metals, this product is ideal for saltwater and chlorine swimming pools and it accommodates sliders of up to 275 pounds. The best feature, the product complies fully with the CPSC safety standards for pool slide and is recommended for inground swimming pools. That’s not all because it comes with a 3 years warranty that covers any defect that might have occurred during manufacturing. The product also comes with an installation guide, ensuring that you take little time when assembling and installing it. Accommodates people of up to 275 lbs. Choose between left or right curve. Kids might struggle when climbing. Inter-Fab WRS-CLG-SS is a bestseller in the United States. The product is safe and fun, ensuring that you will have the best moments of your life will sliding down and making a splash in your pool. With this slide, you are guaranteed of saying “wow” when you take your first wild ride. A breeze to install, the slide comes with a clear instructions guide or you can head over to inter-fab.com and watch a complete installation and assembly video. Just like other Fab’s slide, you can connect this product to a garden hose or to your pool’s pump return line to get the much-desired water for smooth sliding. With that said, you need to note that garden hose will require an additional adapter kit before you connect. Available in four different colors of gray, tan, blue, and white, you can choose the color that matches your house or deck and the slide can accommodate sliders of up to 250 lbs. Safety is also a concern, and this model was designed to the highest safety possible as well as performance standards. You will also be excited to learn that you can choose between a right and left curve, with a true semi-circular and deep flume style path. The product has fully enclosed stairs and offers great grip around handrails, which happen to be safe. The product is made in the United State and comes with a 3 years warranty. It is impact resistant, durable, and made of a stainless steel material that doesn’t rust easily. Hose will require an additional adopter. S.R. 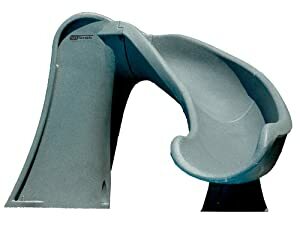 Smith 698-209-58124 Cyclone Right Curve Pool Slide is one of the best slides on the market today. The product features the majority of the amazing features of the best slide including great safety features such as an enclosed ladder, molded in handrails, and little-exposed metals, connectable to a garden hose, accommodates adults and children of up to 175 lbs, rotomold design, and it follows the CPSC safety standards for pool slides. The rule of the thumb is the higher your slide the deeper you pool should be. Again, go through the CPSC safety standards and consult your local safety regulations and codes before you install a pool slide. Pool slide steps, stairs, ramps, or ladders should have treads instead of rungs; especially if the slope is greater than 15 degrees. Slide steps need to be slip resistance, meet specific dimensions, performance requirements, and have tread curvature; check your state or country guidelines. The minimum dimensions are for ladder platforms with a nonslip climbing surface as well as handrails. The angle of the slide ladders or steps needs to be in such a manner that the user’s center of gravity (COG) is well-balanced on every step during the climb. Fasteners should be durable and not prone to breakage, cracking, or becoming loose. The weight-bearing capability should be at least 200 pounds without damage or failure. Handrails need to meet specific design safety, extension height, length requirements, and positioning. Pool slides should be wet for better and safer sliding experience. Check for leaks from the water supply line. Q: How should I maintain my discolored pool slide? A: A pool slide is always located out in the open where it is exposed to harsh elements such as the sun. Because it can discolor easily, use a polish or glaze kit to restore its color. Avoid painting a discolored surface because the continued exposure to the sun and sliding friction will easily make the surface look worse. In addition, painted surfaces or slides can oxidize, leading to powdery steaks on the bottoms and backs of the sliders. Q: Can an adult slide in a pool slide? A: Why should children have all the thrill? There are pool slides that can handle adults’ weight. Here, you need to get a slide that can handle about 200 lbs. Q: Where do pool slides get the water from? A: Some of these slides get the water from a garden hose while other gets it from your pool plumbing system. You can easily use your plumbing system if you install the slides when constructing your pool, otherwise, a garden hose will be sufficient if it is a later installation. Q: What are the major surface options for swimming pool slides? A: The most common surface options are fiberglass chutes and rotomold/prefabricated polyethylene. Polythene is the best surface but it is more expensive than fiberglass. You can also get other custom made surface made of tiles, pebbles, and concrete. These surfaces are often covered with wax-resin for additional safety. As you have seen, with hundreds of options on the market today, chances are that a single pool slide won’t satisfy all sliders needs. Instead, it makes sense to determine the qualities that you really want and the one that suits your pool in order to get the best pool slides for your pool. Of important, ensure that you slide is safe and offers the much-sought excitement.